Not yet published. Ships 6/1/2019. Britain's most trusted cook has been showing the nation how to make delicious, foolproof food for decades. This brand-new collection brings together everything we love about Mary—wonderfully simple but utterly dependable recipes that are essential for every home. These are recipes everyone can enjoy cooking and eating, no matter their time, budget, or confidence. Featuring all the recipes from Mary's new television series, each accompanied by Mary's no-nonsense tips and techniques, this stunning step-by-step cookbook ensures perfect results every time. 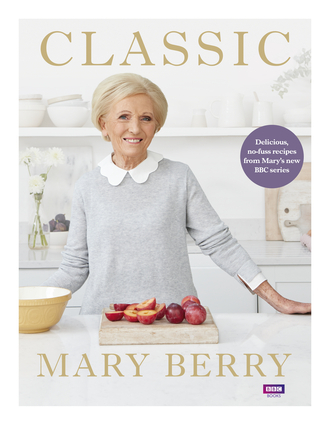 From ever-popular classics like Rack of Lamb with Orange and Thyme Sauce or Lemon Meringue Pie, to a perfect loin of pork with apple sauce, Mary cooks alongside you every step of the way. Includes metric measures and conversion charts. Mary Berry is the much-loved former judge on the BBC's The Great British Bake Off and PBS's The Great British Baking Show, and the author of over 70 books.